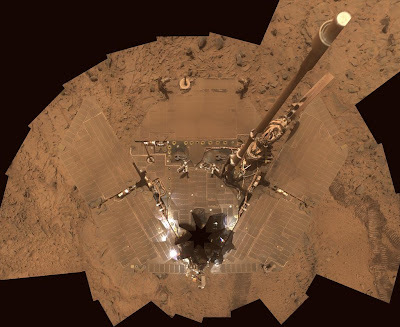 Today marks Spirit's 1400th Sol, and Opportunity's 1379th, putting the rovers near their 47th month on Mars. They were only intended to last three months. However, dust is once again starting to build up on their solar panel arrays, as shown below. This image was taken from Spirit's Panoramic Camera (PanCam). Note how difficult it is to even tell the rover from the Martian soil now. Somehow, the rovers still trek on in this state. Spirit is expected to be left stationary this winter, as its dusty solar panel array may not provide enough power for heat, communication, and movement at the same time in the dim winter sunlight. The rovers have once before recovered from such a dusty state. A dust storm in June of this year was expected to thoroughly coat the rovers' solar arrays with a thick layer of dust, rendering them immobile. Instead, the high winds actually cleaned them off! Here's to hoping for another such windy day! One of Spirit's more recent findings was an area of soil extremely rich in silica. The soil in this area of the Home Plate is more than 90% silica. Concentrations this high are unheard of, and on Earth, are usually found in areas with hot mineral springs. This is one possible cause, among others. 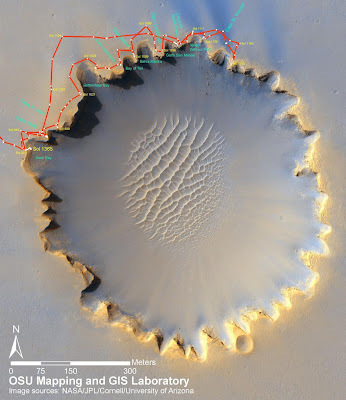 Opportunity, on the other hand, is doing more exploration of Victoria Crater. Opportunity arrived at Victoria Crater on September 27th, 2006 (Sol 951), and has been exploring the rim and basin since then. Its travels can be seen below. Notice Sol 1365, when it enterd the basin via "Duck Bay". It's an incredible in conjunction with very helpful piece regarding main features. My business is thrilled you spread such a points in this article. At this point simply click here check cashing You should definitely continue being persons well-advised along these lines. Get pleasure from dealing with.